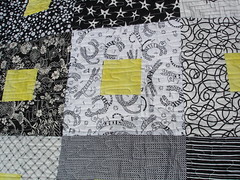 I go back & forth between calling this my NYC quilt and the post-it note quilt. 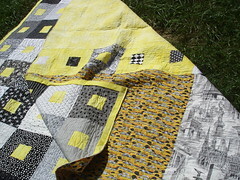 The yellow looked a lot more like post-it notes before it was quilted. That gray print is NYC monuments & The other print is Taxi Cabs. I so can't wait to do the hand part of the binding so I can throw this one in the washer & dryer to get crinkly. 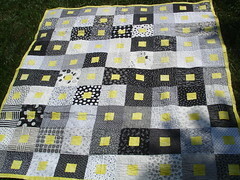 Oh I love this quilt!!! love black/white together! it is so great! I vote for NYC Quilt. That is what I think of when I see it. I just love this- and yellow isn't one of my favorite colors. It looks so nice as the center of each square- it warms up all that black and white. Great quilt. I read all the comments you included with the pics, too. I agree about that whole piece on the backing - using that NYC fabric there. That worked out perfect. Amy, you are just kickin' it out of the park, girl. :) That's 2 great quilts in 2 days. Plus a husband and a job and a Jacob to boot! This is really lovely! Love the colours and the quilting looks awesome. This quilt is wonderful! 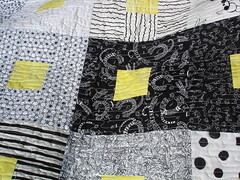 I love the fabrics and the yellow "post-its". Is this for the b&w challenge? The purple quilt is great too-like a painting in fabric! I think I'd call it "Hey, taxi!" It visually references both yellow taxis and Checker cabs. It's really great! I love these latest two quilts. They're very fun! I have that Paula N. fabric - that's a great idea to use it for. And I love the "Post-Its". That's a lot of B&W fabrics! And great kitty fabrics too, BTW. I really don't think I have ever seen B & W with yellow and I love it! Very striking! How about yellow taxi cabs on black pavement instead of post-its? Taxi's are so NYC! I love it!